You will all, I am sure, by now be aware of my brownie and cookie obsessions. So when I saw a recipe for chocolate brownie cookies in this month’s Waitrose Kitchen magazine, I ran immediately to the kitchen to knock-up a batch. Brownies and cookies combined? Why hadn’t I thought of this before?? What a concept!! I have written before about my search for the perfect cookie. One that is crunchy on the outside but chewy in the inside. One with chunks of dark chocolate, still slightly melted from their time in the oven. I’ve also shared my views on what constitutes the perfect brownie. Similar to the cookie, it needs to be squidgy and soft in the middle but with a slight crust on the outside. Well, dear reader, these chocolate brownie cookies tick all boxes for both cookies and brownies in one go. A glorious chocolate overload – brownies masquerading as cookies in a delightful fashion. To be honest, there is little else that needs to be said about these beauties. If you haven’t already run to the kitchen to get baking, run now! I implore you! You are in for a treat. 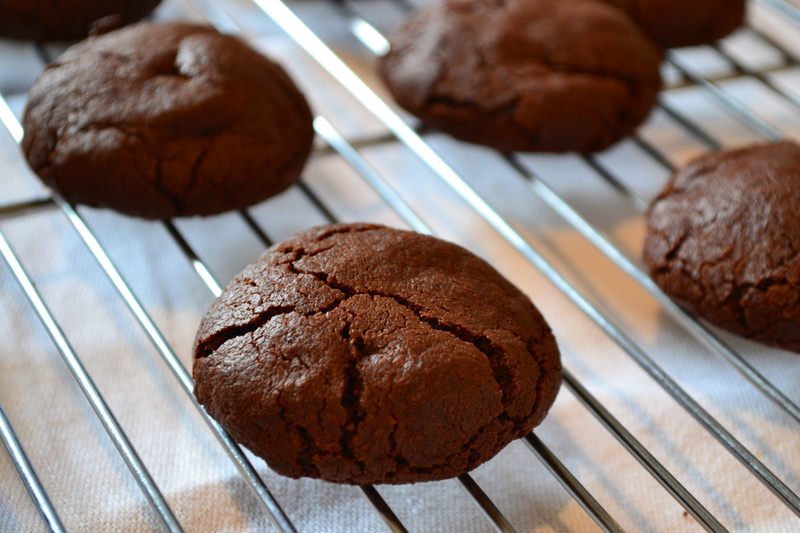 *Update 12/10/15 – having run out of cocoa powder whilst making these at the weekend, it turns out just 60g cocoa powder with an extra 60g flour tastes just as good as when using 125g cocoa powder…probably due to the large quantity of actual chocolate! 1. 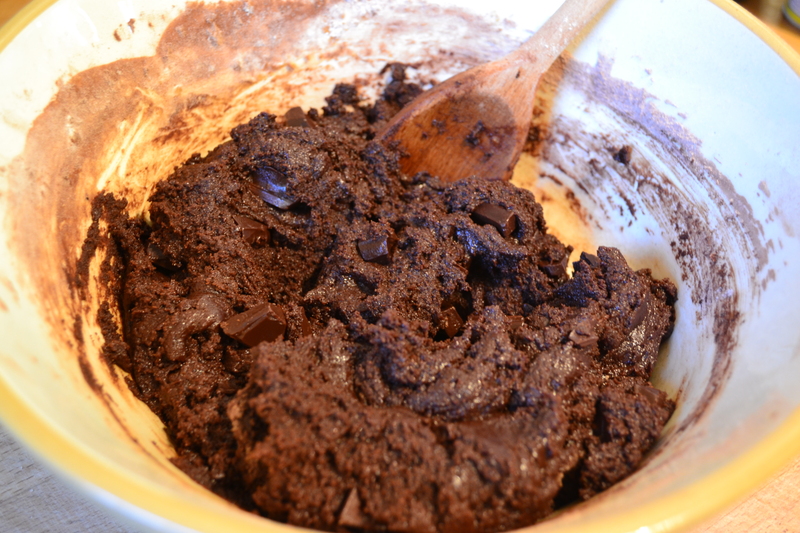 Melt 150g of the chocolate in a bowl set over a pan of barely simmering water or in a microwave. Leave to cool briefly once melted. 2. In a large bowl, mix together the butter and sugars until well combined using a wooden spoon. Mix in the egg, treacle, vanilla, and melted chocolate. In a separate bowl, mix the flour, cocoa powder, baking powder and salt together then add to the wet ingredients, together with the remaining 150g of the chopped chocolate and stir until all combined. 3. Form the dough into 28-30 balls. Cover and put in the fridge to chill for at least an hour, or up to 3 days. 4. Preheat the oven to 190°/170° fan/gas 5. 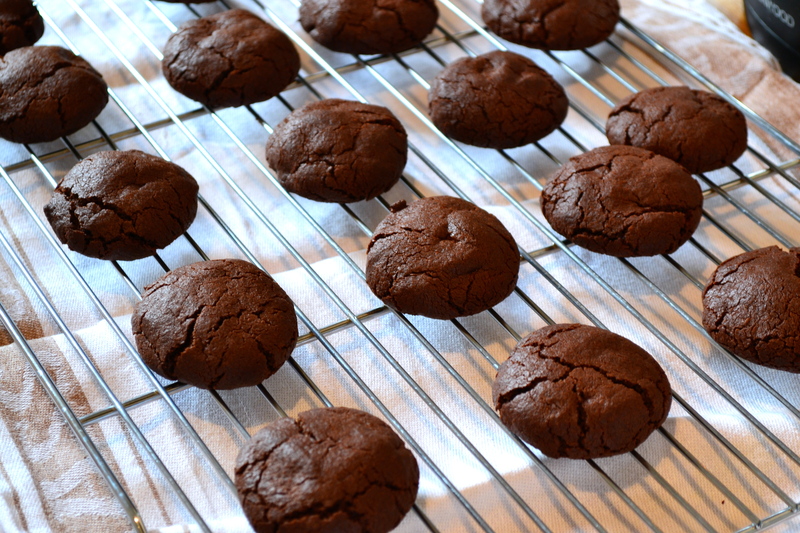 You’ll need to bake the cookies in batches – about 6-8 cookies per tray. Place the balls of dough onto a baking parchment lined baking tray and bake in the oven for 10 minutes until cracked but still soft. 5. Cool on the tray for 10 minutes and then transfer to a wire rack to cool completely. Best eaten on the day of baking but you can store them in an airtight container for a couple of days. P.S. The original recipe says to melt some chocolate and drizzle it over the the cooled cookies. I omitted this step out of both laziness and the fact I thought there was probably enough chocolate involved already. But if you want to, just melt 100g of dark, milk or white chocolate and drizzle over the top once the cookies are cool.